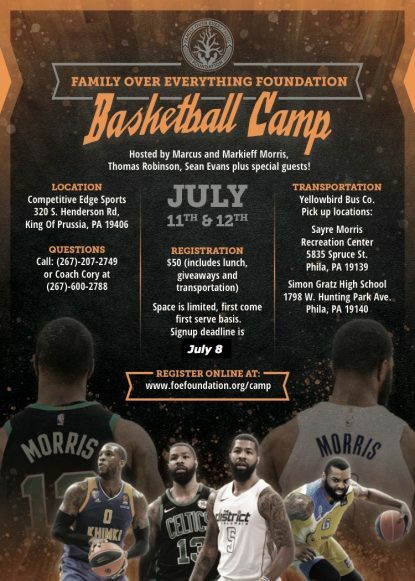 Founded by professional basketball players Marcus Morris, Markieff Morris and Thomas Robinson, along with Thomasine Morris, the Family Over Everything Foundation invites boys and girls ages 7-15 to attend our annual summer basketball camp on July 11-12 at Competitive Edge Sports in King of Prussia. The registration deadline is July 8 and we have limited capacity, so we strongly encourage sign-ups ASAP! The cost is just $50, which includes lunch, special giveaways, and transportation to and from camp at several locations in Philadelphia. See attached flyer and registration link below for more details.